Great News! Kris and I welcomed our second son, Charlie Kingfisher Anderson, on 30 August, after less than 2 hours in hospital. Here’s a pic of us after the birth. A big THANK YOU to my husband Kris for his eternal love, and happy Father’s Day too!! I also want to thank our families, and all our incredible support network. I’ve wanted to be a Mum since I was six. Until I was 29 (my turning point age as a Master 29/11 lifepath), I tried the ‘normal’ ways to find security, get married and have kids. It didn’t work. I kept changing jobs, attracting flaky partners, and couldn’t fall pregnant. Eventually, I realised that, I’m not here to fit in, I’m here to freak people out, in a good way! It was only when I followed the 11:11 prompts, and chose freedom over money and approval, that I achieved my goals. Soon after I quit my job at 30 to become a psychic, I met my Soulmate Kris Anderson while teaching romance palmistry, and we’re now married with two sons, whom I had at 35 and 36. As they say, people don’t rise to low expectations. You’re either evolving, or going extinct. Growth is safer than fear, and we have a duty to get out of our own way. When you stay stuck, you’re not only blocking yourself, you’re preventing other people from taking your unwanted house/ job/ partner etc. and holding up life. So take a risk – it’s far less effort to rocket your baby forwards than to hold them back. I should know! -Charlie Kingfisher Anderson was born at 8.21am on 30 August 2017. He was 54cm, had a near perfect Apgar (9-10) and weighed 3, 332 grams. As with Forrest, although my fundal height measured below average, he was completely healthy. Being a six foot Asian means that I don’t fit into most doctor’s expectations – I create my own normal. -Charlie’s labour was 5.5 hours, incl. 100 minutes in the Royal Brisbane and Women’s Hospital Birth Centre (where I delivered Forrest 18.5 months ago). I didn’t have time to use the waterbirth tub (it also didn’t feel right). Although things went quickly, I’d had Braxton-Hicks cramping for weeks – this is something I ask all my babies to do, so we’re partly done by the time we start. I believe that you can’t skip your homework, and that it’s easier to ‘do the emotional and physical processing’ during pregnancy than in hospital. 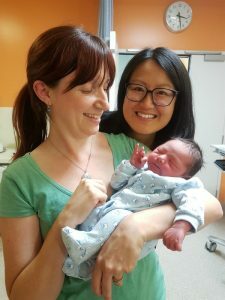 So Charlie’s birth was like a stir fry – everything and everyone was ready to go in advance. I’d tipped the odds in my favour as much as possible. -It was a natural birth with no tear this time (yay). I just had grazing. I’d visualised a slow and easy ‘crowning’ hundreds of times, and things went to plan. There was no need to push as Charlie was keen to come out – he’d wanted to arrive earlier (around 37-38 weeks) so he could play with Forrest, but I encouraged him to wait until 39+ weeks so he was stronger, and I could do less work! I just did a few ‘blowing on hot chips’ breaths as he emerged, which I’d learned in yogababy classes in Brisbane. For a full outline of the pain relief methods I used, see the notes section at the end. Many of you know I see 11:11, study repeating numbers like 111, 222, 333, and do numerology readings for a living. Given that we got to hospital at 11:11 for Forrest’s birth, it’s no surprise that Charlie’s arrival was also magical. -Visitations. The week Charlie was born, I took a video of Forrest in our bedroom and it was full of orbs/ Spirit helpers. When my friend, psychic Vicki Haspels did a healing and reading for me two days prior, we also felt the house light up with Angels, which would explain why Forrest kept talking to Spirits around me. -Dreams. I’d asked Charlie to let me know when he was coming, so we could get to hospital on time. He did a great job! After waking at midnight on Tuesday, I meditated, then dreamed of telling my Mum and sister I was in labour. I woke at 3am with cramping, stretched then went back to bed. I then dreamed I was doing numerology readings, but had to stop due to contractions, which were strong enough to wake me. -Clock Signs. When I got up, it was 5.51am, which made me pay attention. 551 and 155 are my Spirit Guide’s call signs and they always mean I’m in a big turning point – see the story/ photo from my podcast about 11:11 above. And yes, 5.51 adds to 11. 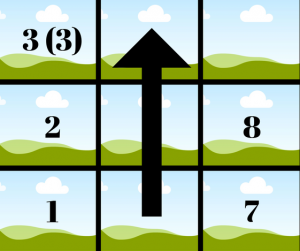 -Number Sequences. Now that Charlie is here, our family consists of a 9 lifepath (Forrest), 10/1 lifepath (Kris), 11/2 lifepath (me) and 3 lifepath (Charlie) – 9-1-2-3 – what a powerful team for change! It means we’ll be good at working through big dramas as these are the numbers for death/ rebirth. Funnily, as I was resting, Kelly our midwife (and a 4 lifepath) sat in a square with us, and I realised our lifepaths were 1-2-3-4. Love it! -Repeating 11’s. Charlie’s birth time, 8.21, is an anagram of my husband Kris’s 28/1 lifepath, plus it adds to 11. My patient number added to 29/11. Plus, Charlie’s exact birth weight 3, 332 grams adds to 11. Charlie and Charlie Anderson also add to 11, plus Charlie’s 30/8 birthday gives him an 11 First Pinnacle, suggesting early spiritual tests and a public life. Read about his name in Part Two. -Repeating 3’s. As I left home, I grabbed a yellow triangle block with ‘3’ on it, that Forrest left on the floor. I like to hold things during labour, plus it reminded me how lucky I was to be giving birth again. I often read for couples who are overcoming miscarriages, so am conscious of how humbling it is to be a parent. 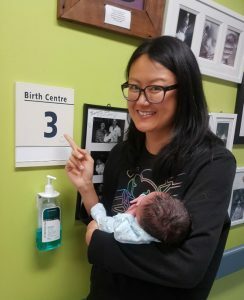 Charlie was born at 39 weeks, weighing 3.33kg in Suite 3 (see photo). Beside the bed was a hotline sticker with 333. My labour started at 3am, we arrived at hospital at 6.30am, and left at 3.33pm. It was a three-spotting fiesta! What does 333 Mean, Anyway? In the Tarot, ‘3’ represents the Empress and fertility. Authors like Doreen Virtue say 333 is related to the Ascended Masters. I feel it’s broader. It’s about choosing hope over despair, focusing on the good and having the guts to say what’s right. At its best, 3, or Solar Plexus energy combines intelligence, humour, communication and discipline to light up the world. 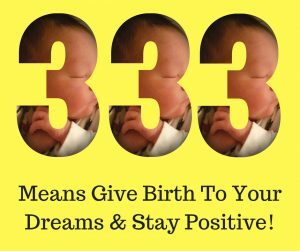 In numerology, FAMILY, BIRTH, PASSION, BABY and ART have a 3 vibration, backing my idea that 333 is about expressing your ideas in public, and standing out*. Did you know? The word DOCTOR also has a 3 vibration, as 3 is about focusing on solutions over problems, using words to heal, and being the authority in your life. Out of balance, 3 energy shows up as too much ‘inner critic’ or ‘upset child’, and not enough ‘outward genius and self-parenting’. No wonder TEACHER adds to 33… So, if you are seeing 333, ask yourself ‘am I choosing energy-giving or energy-draining situations and relationships right now? Is my foot on the accelerator or brake? What could I do to take back my power? See my post 7 Can opener relationships that shocked me awake – are you in one? Read more on doctors, triple numbers and word/ name analysis. You may also want to check your lifepath and personal year forecast – perhaps you have 3 numerology like Charlie! Based on his DOB, 30/8/2017, Charlie is a 21/3 Artist lifepath, here to heal his Solar Plexus Chakra, and this energy centre in others (including me). 21/3 is the vibration of words like ANGEL, SUGAR and ROSE (funny, I’ve been taking the White Light Angelic Essence – blog to come). 21/3s are hard-working leaders, who want to inspire people through acts of kindness and joy. They are Angels in human form. Famous 21/3 lifepaths include Yul Brynner (The King and I), Judy Garland (The Wizard of Oz) and Dannii Minogue, which is cool, because Kris is in film/ TV, and the first thing I saw in Charlie’s palmistry was a writer and performer’s fork. Weird but True: During pregnancy I developed a wart on the sole of each foot at my Solar Plexus chakra, making it hard to walk/ move forwards. It wasn’t shoe related as I hadn’t changed what I wear. Nothing improved them, until I had reflexology with Sand (The Footprint Connection), and confronted various male/ authority figures (including my Dad) about perceived injustices. See my post Even Buddhas Get The Blues, where I discuss my Dad leaving home, after 20 years of silence. I also grew scabs on the front and back of my body, where the Solar Plexus and Heart Chakras meet. These are still healing, as I release old grief about giving away my power until now. Being pregnant really does raise your consciousness. Charlie’s day of birth (30) gives him a 3 Day Number in numerology, i.e. more 3’s and extroversion! He’s going to be a hoot to raise. Ian White (Founder of the Australian Bush Flower Essences – see his reading), who I’ve studied numerology with, kindly wrote to me, ‘This little 3 and you are going to have some amazingly stimulating dialogues over the years’. It’s already started – Charlie and I have had some great debates already, particularly about his gender! More on that later. 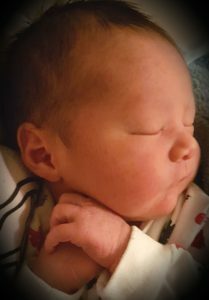 Born 28/8/2017, he would have been a 28/10/1 lifepath like Kris. Born 31/8/2017 he would have been a Master 22/4 lifepath, in my system. Clearly, Charlie wanted to be the black sheep (which shows in his DOB Grid on the left). It has a 1-2-3 Line of Logic and Planning (common in performers and speakers) but is missing a 4, 5 and 6 (see black arrow)*, meaning that he will be radical, impatient and uncompromising. *David Phillips called this the Arrow of Frustration/ Weak Will, but I call it the Line of Non-Conformity, or sign of a black sheep who will buck family traditions. I see this line in the charts of self-made mavericks, who hate mediocrity and need help to achieve their huge visions. In their early lives, they can feel isolated, victimised and uncertain of their purpose, however once they find their confidence (often late 20’s onwards), they’re game-changers who pull off big risks. They just have to believe in themselves, no matter what the critics say. They also need to develop better physical and mental co-ordination, e.g. through cross-crawling, sport, playing music and meditation. They’re here to build bridges, as Nahko sings. Kris and I have this line, and both left our day jobs to chase our dreams/ find each other. Entrepreneur Jack Delosa is another successful 3 lifepath with this feature. Ian White taught me that, the Australian Bush Flower Essence Dagger Hakea is fantastic if you have this line. I’m taking it now (in Relationship Essence) to dissolve resentment and ‘poor me’ energy, which tends to arise when I get less sleep! I’ll give it to Charlie too, if needed. Was Charlie Meant to be a Girl? Until well into the pregnancy, I was sure Charlie was female. Not only had a girl sat on my shoulder before we conceived (similar to Forrest), but every psychic I saw, said he’d be female, and he only showed me female past lives (Native Americans or women in burqas). So when the ultrasound technician said ‘it’s a boy’, I cried and swore out loud. I really wanted a girl at that time. Poor Charlie stopped telepathing me after the scan (I guess I was too mad and low vibration to connect with). Eventually, I did a self-regression on ‘why has this happened?’ and was shown a waiting room with an older girl and younger boy. When the doctor said ‘who’s next?’, the girl stood but the boy said ‘I can’t wait, please let me go first’, and the girl stepped aside. This scene matches Charlie’s restless numerology – even his challenge number is patience! You could say, Charlie is a tailgater, as I got pregnant within a week of weaning Forrest. It’s like when someone follows you out of a parking lot at close range. So I’m fairly sure that, if Kris and I try for a third child, it will be a girl (although nothing is fixed – as in real estate, the sale’s not over until the next owner moves in). Dude, Did I Just Clear My Karmic Debt? I use numerology to plan my work and personal life, as well as to prepare forecasts for clients. The day I birthed Forrest, I was in a Personal 55/1 Day of Beginnings (my Spirit Guide number) and my midwife Nicole was a 1 lifepath, who sees 11:11. The day I gave birth to Charlie, I was in a Personal 76/13/4 Day of Heart Healing (I only have a couple per year) and my midwife Kelly (see photo) was a 4 lifepath. I couldn’t have planned things better. As my birth name* has a 76/13/4 Destiny, 30/8 was always going to be a life-changing date. Your name reveals how you make a name for yourself and your ideal careers. ENERGY HEALING adds to 76, and that’s been the theme of my roles, whether as a scientist, fundraiser, blogger or psychic. During Charlie’s pregnancy, I also began doing trauma-release visualisations, to help clients shift deep physical and spiritual blocks. This was on top of my work doing readings and past life regressions. *I will be changing my name due to marriage (Sarah Anderson adds to 11! ), but haven’t felt the time is right yet. My 13/4 birth name suggests a Karmic Debt (blocked 3 energy/ ideas) and I want to make sure I’ve paid my dues before transitioning. Interestingly, Charlie is a 3 lifepath (see below). Maybe birthing him was the agreement I didn’t complete last time? I get goosebumps when I write that, which suggests it could be true. Giving birth to Charlie was one of the highlights of my life. I felt so supported by my physical and Spiritual teams, and fortunate to be gifted with another delightful baby so soon after Forrest. 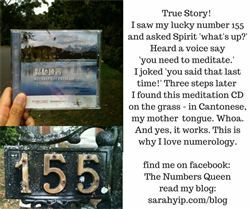 I hope this post will inspire you to create the life you want, as well as research your own numerology….once you realise how accurate the numbers are, you’ll never look back! Understanding the meaning of your life, DOB and name gives you a power that can never be taken away. It will also help you to intepret Spirit Signs such as repeating numbers. For example, as an 11 lifepath, I often see 11’s, while Charlie is a 3 lifepath who is likely to see 3’s. These signs remind us that we have chosen to be here on Earth, and have a mission to heal ourselves before we leave. You are a miracle! As with last year, I didn’t need drugs*, even though I am very sensitive to pain (I cry in Disney movies and wear my iPod to the dentist as a distraction). 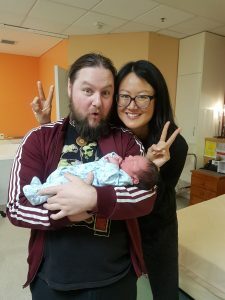 Charlie’s birth was only 1/3 as long as Forrest’s, so although it still hurt, I had much more energy afterwards (perhaps that’s why people say I look so ‘fresh’ in the photos). Pain is just a message for change, and it increases with resistance. During Forrest’s birth, I had a cervical lip issue (where the mother’s body holds the baby back), which is linked to fear. I was scared of being a bad parent back then, but with Charlie this worry was non-existent. My attitude was more, ‘nine months and a day or two of intensity is well worth 50 years of bliss!’ Having experienced the thrill of motherhood, I would trade the rest of my life for five minutes of watching my kids laugh, so when I was in labour, I didn’t care what it felt like, I just gave it my best shot. -Hypnotic music by Snetam Kaur (Wahe guru wahe jio, to remove anger), Nahko Bear (Aloha Ke Akua, Build a Bridge), Deva Premal & Miten (Om Triambakum, Shine Your Light) – I also sang the chant Jewel in the Lotus Flower to keep my heart open. Babies respond really well to chanting in and outside of the womb, as it moderates your breathing and heartrate, plus helps you to relax. -Visualisations (hitting a big red ‘pain relief’ button for endorphins, and seeing my body as an opening rose) I meditate every day to keep my powers of concentration and manifestation tip-top, e.g. see my Angel Meditation. -Vocalisation – chanting, humming (thanks for the tip Jane Leonforte), deep body sounds and er, yelling at the end! -And of course, working with a team of people I trusted, including my midwives from last year. See links to my pregnancy healers in Part 3. *I took Nurofen to relieve afterbirth cramping. I’m not against drugs in labour, but avoid them because conventional medicines are too strong for me. They upset my psychic ability and digestion- after taking Nurofen for just two days, I got jittery when ‘coming-down’. That’s common with empaths – see my post about food allergies etc.